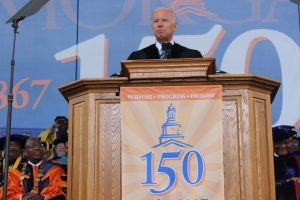 Morgan State University welcomed Former Vice President, Joseph R. Biden as the guest speaker for the 141st Spring Commencement ceremony. He was received with a rousing applause from the crowd of graduates and their families. His speech began with a brief anecdote about how he first heard about Morgan, growing up in Wilmington, Delaware. He first acknowledged all the friends and family that came to support the graduates and congratulated them for raising the students and reminded them they were due a pay raise because of no more tuition costs. Then he reflected on how giving commencement speeches were a tough job. The former Vice President did not disappoint, his message for the graduates was profound and inspirational and only took a half hour. He touched on the school’s long history, including giving credit to Morgan’s pioneering sit-in demonstrations at the Reed’s drug store. Even crediting them for inspiring him to participate in sit-ins when he was in high school. Biden encouraged the graduates to remember the Promethean Walk, and the obstacles that were in the way then. Not only did they overcome them to finish the walk, they also reached the ultimate goal of graduation. He wanted students to reflect on the past to prepare them for the future. Then he began to remember his time as the Vice President for former President Barack Obama. He spoke on the amount of time spent with him and the relationship and bond that was formed over the eight years. The future under the current administration was addressed. He condemned the embrace of racism and bestowing legitimacy to hate speech that was used in the last campaign. He compared the election results to the candle being blown out during the Promethean Walk, and encouraged people to not get their hopes down. “If you remember nothing of what I say but this, I assure you it is temporary and transitory, it will not be sustained! The American people will not tolerate it,” said Biden. Although he did acknowledge that the barriers that we face are still a factor, he explained that the graduates are in the best position to break down the walls that hold them back as a society. The advance of technology and medicine are the tools that the next generation will use to solve the major problems that will face the future of humanity. Biden concluded his speech with the story about the year he was first elected to the U.S. Senate. In a car accident he lost his wife and daughter, and his two sons were badly injured. He remained in his position while traveling back and forth from Delaware to support his family and maintain his responsibility to the people of his state. He used this story to convey his message that no matter the obstacle it pays off to persevere.